The cell phone has completely changed the way we work and communicate in the age of information. Currently, the most popular cell phone on the market is Apple’s iPhone with over 85 million users in the United States alone. Just like your car or your computer, eventually something will break. Who do you call when your iPhone needs repair? 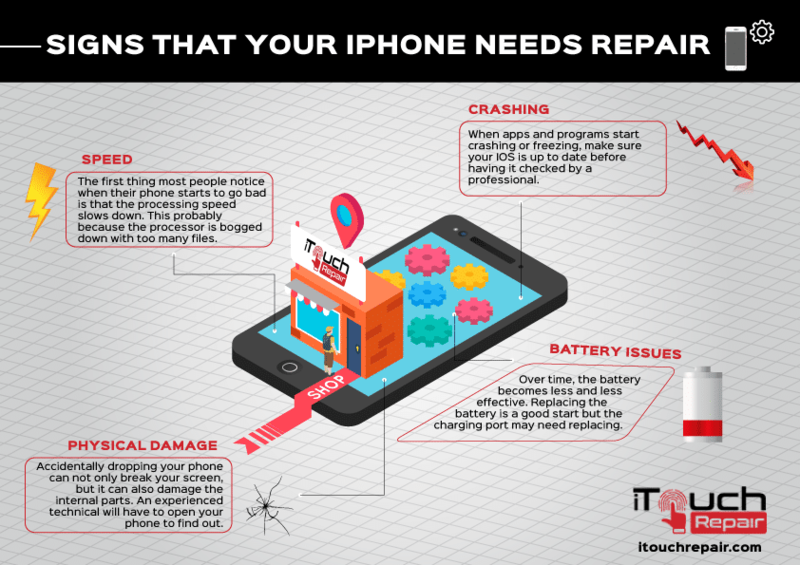 The experts at iTouch Repair have been helping iPhone users in Virginia with their phone repair needs. If you experience any of these signs, it might be time to come in for a cellular checkup. As with most electronics, speed is usually the first thing to go as the device ages. This is the natural progression of most phones; the more you use it, the slower it gets. Apps, MP3s, movies, photos, and documents take up valuable processing space on your phone’s hard drive. Regular usage also adds to the wear and tear on internal components. Clean up your files on a regular basis by removing documents you don’t need and backing them up on your computer or storage drive. Apps like Speedtest by Ookla can help you monitor your phone’s speed. Have you ever been working in a app or playing a game on your phone when suddenly it freezes? This is usually another sign that something is wrong. Overheating can sometimes cause your phone or an app to stop working. Try turning your phone off for a few minutes then turn it back on. If the problem persists, uninstall and reinstall the app. Also, make sure your IOS is up to date. If you still have issues with apps crashing, freezing, or not responding, have your device checked by your local certified repair technician. As your phone ages, you’ll probably notice that it needs to be charged more often. Over time, your phone’s battery will lose its ability to hold a charge. Sometimes replacing the battery will solve this problem, unless it’s an issue with the actual charging port. Dirt and grime can build up inside the charging port, severing the connection when you plug it into your wall charger. Since the iPhone is entirely self-contained, it must be opened and tested by trained iPhone repair technician to figure out the exact source of the problem. Accidents happen. At some point in the life of your phone, you’ve probably dropped it. If you have a durable case, this can protect your device from most cosmetic damage. The force of the impact, however, can still do damage to the internal parts of your phone. An experienced iPhone repairman can determine the source of the problem by checking impact sensors inside the phone. They can also replace cracked screens and repair other cosmetic damages.